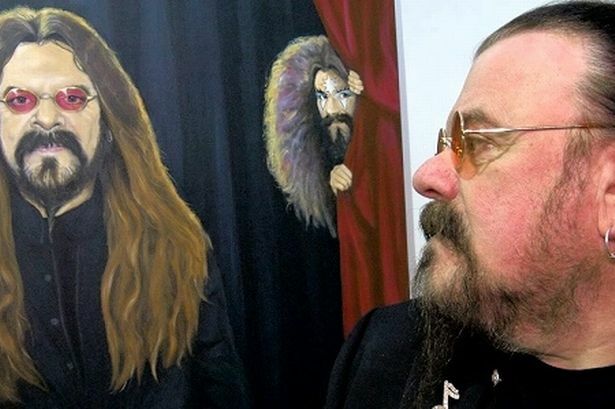 Art student turned rock star Roy Wood is now the subject of a new art exhibition. Art student turned rock star Roy Wood is now the subject of a new art exhibition. Graham Young reports. It’s known as ‘the circle of life’ in The Lion King and, today, Birmingham-born rocker Roy Wood is experiencing a similar sort of phenomenon. The former Moseley School of Art pupil who became a pop culture icon is the new main attraction at a pioneering gallery in his own city. Portraits of Roy’s many rock star incarnations have been painted by an Australian artist who only ‘met’ him via Skype on the exhibition’s opening night. “You normally only get to see yourself in the mirror,” says Roy, studying each of Debra Dee’s pictures for the first time. “Sometimes I look at these and think some of them don’t quite ‘get there’, but then you take a second look... and I think she’s done a really good job. She really knows her stuff. The paintings revive memories of Roy’s own school days. “I remember the headmaster at Moseley School of Art saying: ‘Don’t paint what you think you can see. Make sure you are looking at it properly and paint what you really see’,” recalls Roy. “Things closer to you are often darker, rather than lighter, which is strange. “Modern art is popular now, but I prefer it when someone has bothered to look at something to paint a likeness. “I’d like to do more painting but the only time I get round to doing it is if I’m designing an album cover. “I use computer art as well and mix it in. I usually paint something, download it and add something to that. “But I’ve done a couple of portraits with pencil and aspects of watercolour to define certain things. “One is of a former girlfriend (he chuckles) and the other is of my daughter, Holly (Wood). His only daughter has designed Roy’s colourful Rock & Roll Band business card, which now identifies him as Dr Roy Wood Hon D Mus following his honorary doctorate award from the University of Derby in January, 2008. “I was over the moon, that was absolutely fantastic,” he says. Hits and honours aside, these are challenging times for the now 64-year-old from Kitts Green. After marrying in three months’ time, Holly will set up home in New York. Roy admits that if she stays permanently then he, too, would love to move to the Big Apple himself. But first he has to tackle two slipped discs and stenosis, a spinal condition which forces him to keep sitting down to stop ‘electric shocks’ in his legs. Bending over his studio controls and the hours of getting ‘carried away’ on his computer are to blame, he reasons, but the eternally youthful pop star within still dreams of more hits. Having not troubled the charts for more than a quarter of a century, though, what are the odds. Why do pop stars run out of hits when authors seem to keep going? As we sit in the St Paul’s Gallery office in the Jewellery Quarter, the man who has belted out out I Wish It Could Be Christmas Everyday for 38 years ponders for a moment. “It could be a mixture of a lot of things,” he says. “From my point of view, the management didn’t care any more. Suddenly, you are struggling. “Music has also become more part of fashion and, once you have become unfashionable, you don’t get hits any more. “In my day, if it was a good song, people liked it and it was popular for years. “But I think there is a terrific lack of good songwriters. A lot of bands tend to rely on computer programmes and not enough on trying to create something from scratch. Roy enjoyed No.1 hits with both The Move and Wizzard; in between he was with early ELO who became chart-toppers after he’d left. His place in musical history was further sealed on September 30, 1967, when Tony Blackburn opened Radio 1 by playing The Move’s Flowers in the Rain. After Wizzard’s saxophone-flavoured hits such as Ball Park Incident and See My Baby Jive dried up, he went solo. Releases include last year’s ‘old and new’ album on EMI called The Music Book. “I don’t watch The X Factor, but I would not imagine that people are encouraged to to sing their own material,” he says. “And if they win, their first hit is an old hit from somebody else! “Over the years, people have asked ‘Why don’t you write another Christmas song’ and I’ve thought about it. “During the late ‘80s I wrote a song called Sing out the Old... Bring in the New and thought a New Year record would have another couple of weeks to gain momentum sales wise. Yet Roy might have ended up writing for Elvis thanks to his mid -70s songwriting publisher being “headed by a German bloke called Freddie Bienstock. “I said I would love to see him live to see what he was doing, because the only things I was influenced by was the early stuff and I didn’t much like the Vegas years. “But I thought I would like to see him sing and get squared up with his voice to try to get something like the excitement of the early days. “Of course, Elvis fell ill and, very inconsiderate of him, he died. What can you do? “I could have written something. I was booked to go and see him singing in Lake Tahoe, you wouldn’t believe. Roy had an even closer encounter with fellow former art student turned Beatles’ star John Lennon. “When I was in The Move we played at the Alexandra Palace and were on there with Pink Floyd and, I think, Jimi Hendrix was on the same bill. “The changing rooms were right at the other end of the hall. “I went on stage to try a five-string guitar out and to make sure the amp was working. “I was walking back to the dressing room and who should be walking towards me in his Afghan coat and with the glasses on but John Lennon, who had another bloke with him. “Lennon came to a soldier-like halt, and he saluted me. I saluted him. “And then he just walked off, he never stopped to chat. “Then I heard him go: ‘Brilliant man’. When was Roy at his happiest? “I’ve tried to make each new band slightly different than before, so a musician’s favourite is always the newest thing that he’s doing,” he says. “Even though The Move was successful, it wasn’t a happy band. I was never that happy in it. “Now I’m surrounded by people who are really good musicians. The best you can get and good fun to be with. “Always, but live-wise, the only things I play on stage now are guitar and bagpipes. “I can play the saxophone, but you get great players in the band so you don’t need to do it because they are better than you. “I’ve just written a swing track and put most of the instruments down on that. “I played it to the band and the sax players, who are superb, thought it was good so I was well chuffed. “We never made a lot of money in The Move, but once I made a little bit of money I started collecting instruments. “I used to go into second hand shops and see a bass or an old oboe and I’d buy it regardless of whether it worked or not and get it fixed up. “It’s difficult to have all of that stuff and to not have a go at playing it. I’m quite nosy when it comes to instruments. I would say I play a lot but none of them perfectly. The paintings in the Roy Wood collection are retailing from between £1,100 to £3,500. Their titles vary from The Understudy (£1,600) to The Red and Blue One (£1,750), Reflections (£3,500), The Songwriter (£1,500), White Magic (£1,600), Songwriters’ Trinity (£1,800), The Muse (£1,600) and, simply, Roy (£1,100). Artist Debra Dee, from Lobethal in South Australia’s Adelaide Hills, began to paint as an escape from her unhappy family life caused by her parents divorcing. She stopped painting in favour of being a mother and now has two children of her own as well as having adopted five siblings. Talking about her first works for 20 years, Debra says: “Roy is a dream subject. “Good looking, sure, but with loads of character and multiple personas. “He has a great sense of style and seems to continually re-invent himself. During her Skype conversation with Roy, Debra reveals she is moving on to Noddy Holder and Ozzy Osbourne and would love to paint Jasper Carrott, too. “You’re painting all the Brummies!” says Roy.